Rafa Benitez' side edge away from the bottom three but Burnley remain just a point above the drop zone. Thank you for joining us to enjoy what has been an enthralling contest at Turf Moor. The Clarets will now prepare for a massive game on Saturday against Crystal Palace. Meanwhile, Newcastle will be confident of extending their good run of form with a home tie against West Ham. But what next for Burnley? They remain just a point above the bottom three who are all on eight points. Last season, they built their success on a strong back four but their defence has looked all over the place throughout the season. They still pose an aerial threat going forward but there doesn't seem to be much of a Plan B.
Newcastle end their Monday night curse, pick up their first away win of the season and ease relegation fears with a third successive win. 90+5 Matt Ritchie hacks down Aaron Lennon to give Burnley a free-kick in a dangerous position with just seconds remaining. ...but heads wide...with the last touch of the game. 90+2' Joe Hart has spent the best part of a minute in the Newcastle half and ventures into the penalty area for a poor corner that fails to beat the first man. In fact, he is playing further forward than some of the back four. 90' Isaac Hayden comes on to protect the lead after a quiet night for Kenedy. 87' Panic appears to be setting in for Burnley. Every venture forward seems to be nervously rushed and they aren't retaining possession. 82' Late attacking changes from Sean Dyche. 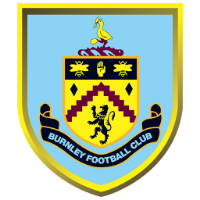 Ashley Barnes and Jeff Hendrick replace Robbie Brady and Steven Defour. Can they salvage a point? 80' Newcastle will be kicking themselves if they don't win this. Perez skips away from a lazy Lowton challenge and releases Joselu into the penalty area. The substitute fires past Hart but his effort rebounds off the post! Not long after, Ben Mee makes another block at the feet of Ritchie. 75' The sign of a striker lacking confidence. Brady picks out Aaron Lennon at the back post who cuts a pass back to Wood. The front man finds himself in space by the penalty spot but spoons his volley over. 73' The home side are pushing for this equaliser. Firstly, Brady shanks an effort wide and then a Vokes cross is just about cut out before Wood can apply the finishing touch. 71' Perhaps Burnley don't need something new?! Robbie Brady floats a flat pass that is taken down by Chris Wood inside the penalty area. The striker swivels and shoots only for Yedlin to poke out a leg. Dubravka may have saved it behind him but the American was taking no chances. 70' Rondon has been surprisingly quiet and is replaced by Spaniard Joselu. 68' Chance for Chris Wood! A bit of head tennis between Wood and Vokes combined with a shocking clearance from Fernandez eventually lands at the feet of the Kiwi. He swings a boot but his strike goes straight into the hands of Dubravka. 66' You wonder where a Burnley equaliser is coming from at the moment. They are lacking a creative spark and a cutting edge. 61' A spinning ball bounces into the air and looks to be falling onto the left boot of Rondon to fire at volley at goal. Yet Matt Ritchie ends up getting in the way and the pair crash into each other as the ball rolls to safety. A few minutes to forget for the Scotsman. 60' Burnley are starting to grow back into this contest but there seems to be a lot of emphasis on the set-piece speciality of Robbie Brady. A lot of pressure for a player clearly still rusty after a long-term injury. 55' Rafa Benitez has clearly had a word after his side were left clinging on just before the break. Newcastle have controlled the ball and looked threatening, whilst Burnley can't rekindle the tempo they ended the half with. Kenedy lashes wide from distance again. 50' One of those that you watch, stare at the goal, take in what you have seen for a few seconds and then come to the conclusion that he has actually missed! DeAndre Yedlin rampages forward and gets behind the Burnley back four. His poked effort is touched away by the foot of Joe Hart but falls to Matt Ritchie two yards from goal. Yet, somehow, the winger places his shot wide when virtually level with the post. How crucial could that miss be? Where is your money for this one?! Burnley played well in patches during the first 45 minutes but fell two goals behind after poor defending. Newcastle haven't been great but should have control of this game only for a bullet header combined by more shaky defensive play to leave the contest finely positioned. Turf Moor was in turmoil when Ciaran Clark put the visitors 2-0 ahead. The home fans were getting on the back of their players and you could sense concern on the Burnley bench. Yet that stunning Vokes header has completely changed the complexion of the game and the hosts ended the first half as the better side. 45' This is all set up for a cracking second 45 minutes! Another Vokes header sends Dubravka scrambling to turn the ball wide even though it appeared to be heading off target. With the home fans finding their voice, the passion spills onto the pitch as there is a bit of handbags between a couple of Burnley players and Ayoze Perez. Referee Anthony Taylor blows up for half-time with this game perfectly poised. 45' Dubravka may have partially been at fault for Vokes' goal with his poor positioning but he has just pulled off a stunning save. This time it is Defour who pings a diagonal ball into Vokes who nods it down for Wood. The striker from New Zealand connects sweetly with his left foot only for Dubravka to spring across and tip the ball wide. 41' Fabian Schar steps out of defence with the ball but fires high and wide from all of 30 yards. 40' A lifeline for the hosts and it came from nowhere! Ben Mee launched a diagonal ball forward and it picks out Vokes just inside the penalty area. The Welshman leaps to meet the ball and powers a header over the stranded Dubravka to claw Burnley back into this contest. 36' Another short corner from Newcastle is worked out to Kenedy but his vicious effort from the corner of the 18-yard box fires wildly off target. 34' With Defour and Cork sitting at the base of midfield for the hosts, Chris Wood has been forced to drop short for the ball on numerous occasions. It appears to be taking a lot of the attacking threat away for Burnley with his strike partner Vokes easily marked by the three Newcastle central defenders. Should Dyche take a leaf out of Rafa's book? The home side have actually played some really good football in the opening 30 minutes but their defence is all at sea. Rafa Benitez has reverted to a back three for this contest - does Sean Dyche need to consider doing the same to plug the gaps? 23' We talked about how set-pieces could be crucial and that is certainly proving to be the case. A short corner comes back to Matt Ritchie who whips a cross over the head of Lowton and is glanced home by Ciaran Clark. What has happened to this Burnley defence in the last six months? 21' With the Turf Moor crowd beginning to show signs of frustration, Chris Wood unleashes a swerving and dipping strike from range that Martin Dubravka can only fumble away. 17' The tempo has slowed but Burnley have a clear ploy they have developed in training. Brady and Lennon look keen to come inside and make a narrow midfield before spreading the ball wide to the full-backs. However, deliveries to the front two have been few and far between apart from the Lowton cross that found Wood. 11' Burnley right-back Matthew Lowton has been busy in the opening stages getting up and down that side of the pitch. The home side have been looking to find him on numerous occasions in the opening ten minutes and this time his curling cross picks out the late run of Chris Wood who can only divert his strike over on the half-volley. 9' Despite that early setback, Burnley are playing some positive football at a fast tempo. Brady and Lennon link up well but there is no end product. Encouraging signs despite going a goal behind. 4' What a start...for Newcastle! Mo Diame saw a shot fire off Ben Mee from just outside of the box and drift out for a corner. Burnley fail to clear their lines and a Fernandez strike takes a huge slice of luck as it spins off the outstretched boot of Mee and into the top corner. We are off and running...Newcastle appear to be playing with three at the back rather than four. Clark, Fernandez and Schar have Kenedy and Yedlin either side of them as wing-backs. The players are out on the pitch and we are almost ready for action. Both managers have smiles on their faces...who will be the happiest at around 10:20pm tonight? Tom Heaton was a regular fixture in the Burnley squad until he dislocated his shoulder at the beginning of last season. 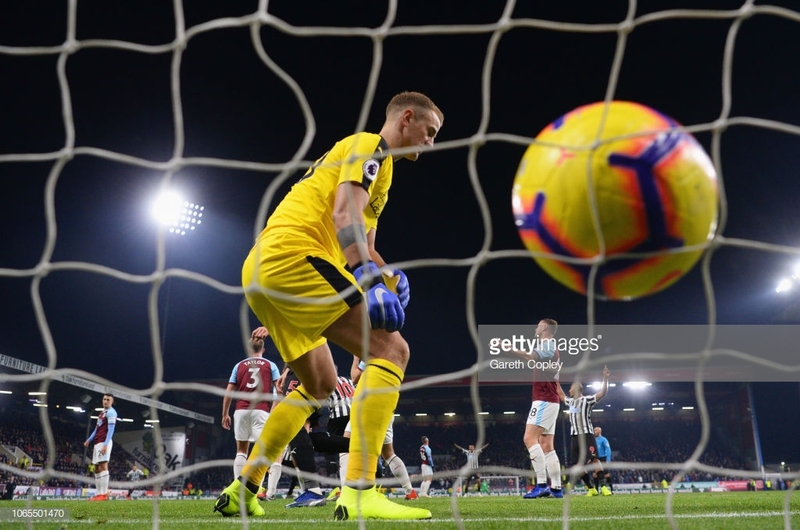 Since then, he has seen Nick Pope rise above him in the pecking order after an incredible breakthrough season before Joe Hart signed and took the number one spot when Pope picked up an injury at the start of this campaign. Recent rumours suggest that Heaton could be heading to pastures new at Leeds United in January. It is a big game for Burnley central defender Kevin Long tonight. In the absence of Tarkowski and record signing Ben Gibson, the Irishman can prove a point in a defence that has shipped more goals than they have been used to under Sean Dyche. Can he cope with the power of Rondon and pace of Perez? Only Callum Paterson and Steve Mounie have won more aerial duels than Burnley striker Sam Vokes this season. The Welshman wins 7.5 per game - out of Newcastle's available defenders, Clark is closest with 3.4 per contest. These two sides are in the top five for number of aerial duels won and the bottom five for average possession per game and pass success rate. Tweet me at @chrisbourne2win with your bottom three predictions. Will Burnley and/or Newcastle be facing a spell in the Championship? We understand that it was referee assessor Eddie Wolstenholme who collapsed in the tunnel. We are hearing some concerning news that there has been a medical emergency in the tunnel. This game is set up to be a bit of a blast from the past tactically. How often do we see two sides in the Premier League line up against each other with 4-4-2 formations, albeit Ayoze Perez will be more of a number ten behind Rondon. In Brady, Lennon, Kenedy and Ritchie there are four wingers who like to make the pitch big. Expect plenty of crosses to strikers who love to attack aerial balls. Don't be surprised if there are a few feisty tackles either. Clark and Kenedy: A recipe for success or disaster? It will be worth keeping an eye on Newcastle's left side of the pitch. Ciaran Clark will have to do a job in place of the injured Paul Dummett even though he is a central defender by trade. With Aaron Lennon enjoying a good spell of form, Clark might be in for a busy night against the nimble footwork of the former England international. And he probably isn't expecting much help from Kenedy in front of him. What a difference six months make. Back in May, Burnley fans were in dreamland as they celebrated a top seven finish and qualification for the Europa League play-offs. Half a year on and they find themselves not just one point off the relegation zone but also a point away from the bottom of the table. Newcastle captain Jamaal Lascelles will be a huge miss when it comes to defending against Burnley’s physical front two. He also scored their only goal against the Clarets across two games last season. Jonjo Shelvey is fit enough just for the bench but Kenedy starts after a starring role last time he played Burnley and he will join Matt Ritchie as the attacking threat looking to serve Salomon Rondon who netted a brace last time out. As expected, James Tarkowski and Johann Berg Gudmundsson miss our for the hosts. How crucial will their absences be? Sam Vokes and Chris Wood will lead the line in a 4-4-2 formation - they will be looking to Robbie Brady’s set-piece expertise to help unpick a shaky Newcastle defence when it comes to defending such situations. It has been quite a weekend at the foot of the table in the Premier League. Fulham grabbed a valuable three points against Southampton in Claudio Ranieri’s first game in charge and Crystal Palace held off Manchester United at Old Trafford for a respectable point. Huddersfield then lifted themselves off the foot of the table with victory at Wolves, leaving the bottom six separated by just one point. Burnley and Newcastle United find themselves embroiled in that battle to beat the drop making Monday evening’s fixture a crucial one for both sides. The two outfits go into this contest with contrasting form. Whilst Burnley have failed to win in their last five league matches, picking up just two points in the process, Newcastle have edged their way out of the bottom three with seven points in their previous three outings. They hadn’t won in ten attempts before successive victories against Watford and Bournemouth who have both started the season well. Yet Rafa Benitez’ side have not won on their travels for eight Premier League matches. The Geordies also haven't defeated Burnley in four Premier League matches, although three of those contests have ended in draws. This fixture last season resulted in a 1-0 victory for The Clarets as Jeff Hendrick netted the winner at the end of October. Newcastle went close to recording the same scoreline at St James’ Park before a late own goal by Karl Darlow grabbed a point for Sean Dyche’s side. Burnley have failed to score in three of their last four matches and could be without the creativity of Johann Berg Gudmundsson who picked up a knock in the goalless draw at Leicester City before the international break. At the back, Nick Pope, James Tarkowski and Stephen Ward are all absent, whilst Ben Gibson is a doubt. However, Steven Defour is expected to be available in the middle of the park. The Newcastle duo of Jamie Sterry and Florian Lejeune are sidelined but there will be a late fitness test for a number of players including Paul Dummett, Yoshi Muto and Jonjo Shelvey. Captain Jamaal Lascelles netted against Burnley last season but is another who will be assessed before the contest. Salomon Rondon will be looking to build upon the excellent physical display against Bournemouth that saw him net his first two goals for Newcastle after failing to score in six previous outings since signing on loan in the summer. A patched up Burnley back four that have failed to defend as stringently as they did last season will have to be on top of their game to stop the Venezuelan. At the other end, Burnley will be buoyed by Newcastle’s poor record of defending set-pieces this season. The visitors have conceded six of their 15 goals from such positions whilst Burnley have netted five of their 12 from corners or free-kicks. Although dead ball specialist Gudmundsson could miss out, Robbie Brady is a more than capable replacement and the likes of Sam Vokes and Chris Wood will be looking to take advantage of his deliveries, particularly if Lascelles is unavailable. Burnley manager Dyche believes his side are close to finding their feet again after a challenging start to the season. He told the Burnley website: “I’ve been very pleased with the players’ training in the past fortnight. The pride they have in how they work is enormous and they have shown me they are keen to get back to it. Yet Benitez is keen for his Newcastle side to build upon the momentum they developed before the international break. He explained to BBC Sport: "We started walking, now we are running and now we have to improve our pace." Join Vavel UK on Monday evening for minute-by-minute commentary of this crucial battle of the basement encounter by following the feed right here.